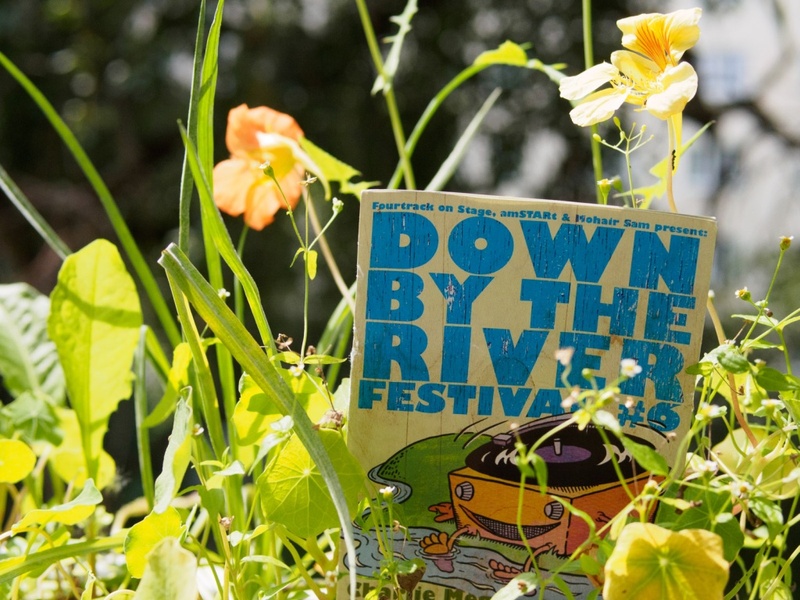 The sixth “Down by the River” festival took place at the about blank in Friedrichshain for the second time. With its wild-romantic garden eden this is an absolutely appropriate location for this diligently curated lovely festival. The festival started out with DC Schneider, a lo-fi guitar, keyboards and voice duo from Munich, today accompanied by a drummer. I had quite high expectations and I wasn’t disappointed – DC Schneider’s gig was really enchanting and definitely one of several highlights of the festival. The about blank featured three stages so the concerts could start right after another and no time was lost due to stage changeover. In the short interludes between the gigs the audience was entertained and directed by the impressive impressionarios David Deery and Mathias Kom. Back to the Laute Bühne: Enter YoYoYo Acapulco! A very melodic couple from Norway. She played the electric bass and he ukulele, small kickdrum, keyboard and chicken-egg. Both sang and their show was very light-hearted and entertaining. Jakob Dobers followed on the Gebüschbühne. Acoustic Guitar, german lyrics and an impressive beard. Somehow his show reminded me of early Funny van Dannen stuff which is definitely meant as a compliment. I had been looking forward to seeing Jolly Goods. They were next in line but the first to play the Krasse Bühne indoors. It was incredibly hot and impressively dark inside so I only managed to listen to the first three songs before leaving and going back out into the garden again. Besides the climatic problems I found their music to be a too harsh break (for me) coming from all the friendly light-heartedness outside. I think the rest of the audience was quite enthusiastic after Jolly Good’s show, though. So Laute Bühne again. Here Schnipo Schranke the secret headliner of the festival entered the stage. Two girls with keyboard and drums singing quite frankly about sexuality and its probable and not so probable complications over cheesy waltz and easy listening sounds. Charming and confusing and apparently liked a lot by the audience. Interestingly they were not allowed to give an encore… because: Heidi Alexander followed on the Gebüschbühne. Heidi Alexander is a singer/songwriter from the US. It all sounded quite promising but directly after hearing Schnipo Schranke it was a lot too deep for me, so I left the Gebüschbühne and had a fantastic iced latte macchiato and a little break on one of the all-weather sofas in the spacious garden. I watched the show of the Sacred Travelers on the Laute Bühne again. The Sacred Travelers is somehow a world-music outfit with strong jazzy vibes that really made the audience dance. Not really my cup of tea but definitely well executed. I wandered back to the Gebüschbühne to have a look at Charlie Megira & The Bet She’an Valley Hillbillies. Very cool outfits and even cooler 50s rock’n roll sounds. I really liked it. After the Charlie Megira show I left the festival and so missed out on ZA!, Zentralheizung of Death des Todes and Skiing. I bet they were cool, too. Here a lot of photos of the festival, taken by our friend ORANGE´EAR.